With the FTSE currently indicating a flat open, as traders are waiting for the release of the UK Index of Services. Although analysts are expecting another negative reading, investors are hoping that the overall improvement will continue. Oil is currently trading below $67 a barrel as the US dollar rose against the majors. The US dollar traded at $1.4590 per euro the strongest level since Sept. 14. Also weakening prices, confidence among U.S. consumers unexpectedly fell in September as a rising unemployment rate weighed on households. 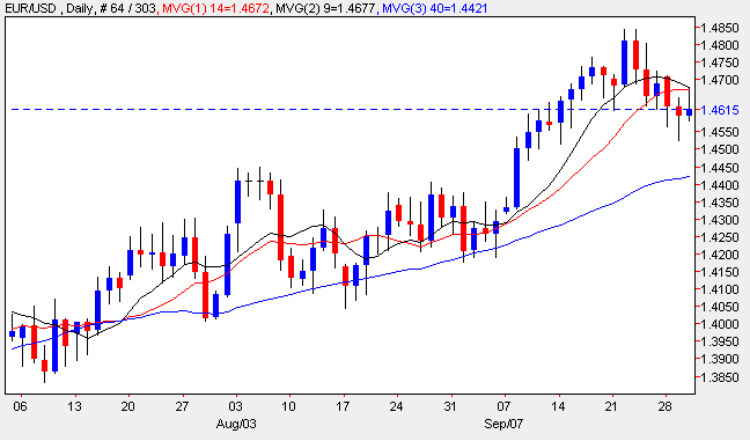 Oil prices are likely to receive some support around the 65 dollar mark. With the US dollar strengthening against the Euro, a 5 day no touch bet on the pair with a trigger above the 52 week high at 1.4825. pays 30% ROI.